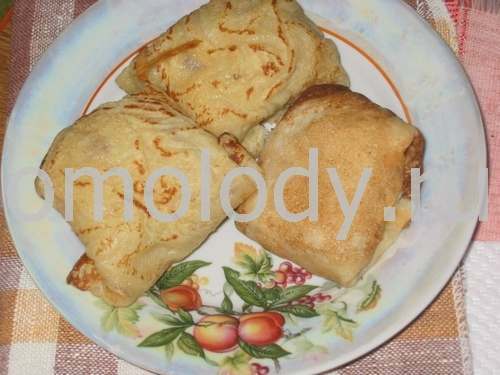 Blini filled with meat - pancakes. 1 cup rice, boiled, well drained. 400 g (14 oz) meat (chicken, or not fat pork, or veal), boiled, drained, minced. 2 onion peeled, finely chopped. 1. Sift dry ingredients in bowl and stir in liquid ingredients with wire whisk or spoon until mixed. 2. Rub griddle or fry pan with oil. Heat until water dropped from your hand bounces around. Drop about 1 ladle or 2 large mixing spoon for each pancake. 3. Cook until bubbled all over the top and brown on bottom. Flip and cook until brown on other side. Repeat with the remaining batter, add oil into frying-pan as needed. Keep your griddle very hot at all times. 4. Put 1 tbsp of filling into centre of each pancake and fold up envelope fashion. 5. Put all pancakes into greased pan. Lay flap down. Cover. Cook on low heat several minutes and serve. Mix boiled rice, boiled minced meat with mayonnaise and pepper. Put onion into hot pan, fry until golden brown, add grated carrot and simmer. Mix fried vegetables with meat and rice.